Philo is a relatively new streaming service, offering a pared-down selection of cable channels that are available for a very low price. You can get 43 channels for just $16, or get a total of 55 channels for a $20 monthly subscription. You can check out our full review here for a more extensive breakdown of Philo’s features, pricing plans, pros, and cons. However, given the low price of the service, it may not be too surprising that there are some gaps in its channel coverage, along with a few other issues that may make it a less-than-ideal choice for some cord-cutters. In this article, we’ll explore the best cable-free streaming alternatives to Philo. What Alternatives are there to Philo? Philo offers you quite a bit for your money. You get DVR with unlimited recordings for 30 days, and you can stream your content on up to 3 devices at once – making it better than comparable services like DirecTV Now and Sling TV in this regard. But, given the low cost of Philo, there are few areas where the company has skimped a bit. One of the main reasons behind Philo’s budget price is that it eschews sports coverage almost entirely. You will not find ESPN, NBC Sports, FOX Sports, or any other major sports networks on Philo – and you won’t be able to watch local FOX, ABC, or NBC channels, either. Sports coverage is relegated to the automotives-focused Velocity – which occasionally airs coverage of car races. If you want sports coverage, Philo is absolutely not for you. However, even if you don’t care about sports coverage, Philo’s low price point means there are still some significant gaps in its channel lineup. With Philo, you can watch programming from several major cable networks like AMC, A&E, and BET, as well as IFC, Discovery, and Comedy Central. However, there is no support for other major networks like TBS, TNT, and FX/FXX, Cartoon Network, SyFy, and quite a few other channels. If you’re looking for a streaming service that can completely replace cable for you, Philo is not an ideal choice. The final problem we have with Philo is its limited device support. The service is still relatively new, so it’s not surprising that support is limited – but it’s still disappointing in some respects. When the service first launched, you could only stream Philo your web browser, iOS and Android, and Roku devices. Recently, though, Philo added support for the 4th gen and later Apple TV, as well as Amazon Fire TV. However, there is still no support for Android. You have to watch your content in your Chrome browser, which provides a poor user experience, and burns through your battery very quickly. If you are not interested in Philo, but still want to subscribe to a “skinny bundle” as a cable alternative, you have plenty of options. Let’s explore your choices now. If poor sports coverage is the primary reason you’re not interested in Philo, fuboTV is a great choice for you. fuboTV began as a sports-focused streaming service, and it still offers the widest variety of sports coverage of any “skinny bundle” subscription. For $45/month, fuboTV includes NBC Golf, Fox Sports and Fox Sports regional affiliates, CBS Sports Network, beIN Sports, Fox Soccer Plus, NBA TV, NFL Network, and NBCSN – alongside nearly a dozen other sports channels. Notably, ESPN is absent – but that’s pretty much the only sports channel that’s not available on fuboTV. Platform support is also better than Philo. fuboTV offers support for iOS/Android, web browsers, Chromecast, Roku, Apple TV, Amazon Fire TV, and Android TV devices. However, you can only stream on 2 devices at once. The DVR is also not quite as good as Philo. You only get 10 show “slots”, or a 30-hour program recording limit. Overall, fuboTV is a good alternative to Philo if you are a sports fan. It costs $45/month, but you can get your first month for a discount and there’s a free 7-day trial available on their website, so you can give the service a try with no commitment. Sling TV is available either in the $25/month “Orange” package, or the $25/month “Blue” package. Both of these packages are viable alternatives to Philo. The Orange Package includes a pretty good selection of channels, including ESPN and other sports channels that are not offered in any of Philo’s package options. However, you will only be able to stream Orange channels on 1 device at a time. 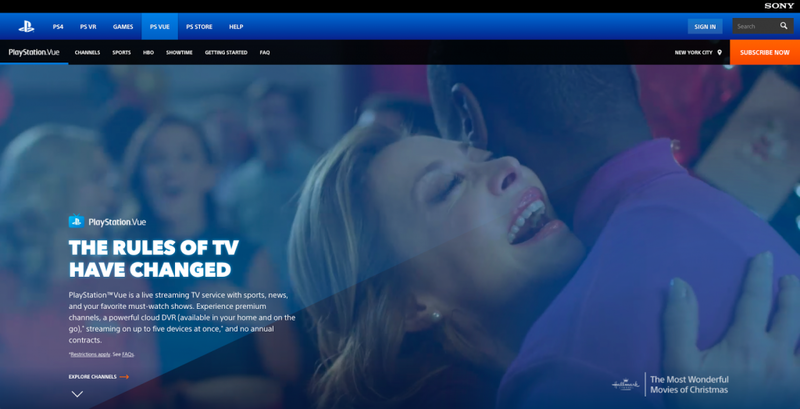 The Blue Package has a similar selection of channels, but lacks ESPN and has a few more cable entertainment channels, such as Fox Sports, NBC, NBCSN, FX, and SyFy. The Blue package allows you to stream on 3 devices at once, which is much better than the restrictive Orange package. You can combine both packages for $40/month, and get 53+ channels, if you would like to have full access to sports coverage and entertainment channels. Take a look at their website for the full breakdown. Sling TV also has great platform coverage, compared to Philo. You can watch Sling on Chromecast, Roku, Apple TV, Amazon Fire, and iOS/Android devices, as well as on some Samsung and LG Smart TVs, the Xbox One gaming console, and your web browser. One area where Sling TV falls short is their DVR. You will have to fork over an additional $5/month for a DVR service. The DVR itself is reasonably good – you get 50 hours of storage with no other restrictions. However, the fact you have to pay an additional fee is definitely a drawback. Sling TV does have some shortcomings, but overall it’s a strong competitor against Philo. Both the Orange and Blue channels offer better sports and entertainment coverage than Philo, and are around the same price – though you have to pay extra for a DVR. If you’re interested in Sling TV, you can give the service a try with a 7-day trial on their website. DirecTV Now is quite a bit more expensive than Philo, at $40/month. However, you get a fantastic selection of cable channels for this price. DirecTV Now certainly has the best overall cable coverage for the price of its subscription. The most basic DirecTV plan gets you a total of 65 channels. This includes entertainment channels like A&E and AMC, as well as TBS, Spike, FX/FXX, TNT, and USA Network, among others. Sports coverage is provided by ESPN, as well as some local FOX sports affiliate networks, and NBC Sports. You can also upgrade to a $55, $65, or $75/month plan to get up to 125 channels including HBO, Showtime, BBC America, and quite a few more. You can check out their subscription page for more details. DirecTV Now also has great platform support, compared to Philo. You can stream your content on a variety of devices, including Chromecast, Apple TV, Roku, Amazon Fire TV, web browsers and iOS/Android devices. DirecTV Now does have a few drawbacks, compared to Philo. First, you are limited to streaming on only 2 devices at once, which is lower than the 3-device limit of Philo. You can upgrade to add another stream for $5 per month. You also only get 20 hours of DVR storage, which is much worse than Philo’s unlimited 28-day DVR. And for $40/month, DirecTV is a bit expensive. However, it’s a much better deal if you are an AT&T Unlimited subscriber. AT&T, which owns DirecTV, allows subscribers to get DirecTV Now for only $20/month – the same price as the highest-tier Philo streaming package. DirecTV has solid platform support and cable channels that make up for its drawbacks, and it’s a good overall alternative to Philo. You can try it for yourself with a free 7-day trial on the DirecTV Now website. YouTube TV is relatively new, and not yet available in all areas of the U.S. However, it has expanded quite a bit in 2018, and is now available in almost every major metropolitan area in America. For $40/month, you get a surprisingly good selection of channels, including sports networks like ESPN/ESPN2, ABC/FOX/NBC/CBS, and Fox Sports, as well as cable entertainment channels that Philo lacks. This includes FX, SyFy, USA, and quite a few more, for a total of 70 channels. You can also stream on 3 devices at once, which ties YouTube TV with Philo for simultaneous streams. YouTube TV also has a better DVR, compared to Philo. The YouTube TV DVR allows you to store unlimited TV recordings for up to 9 months, with no restrictions and no limitations on simultaneous live recordings. This is, bar none, the best DVR you can get from a “skinny bundle” service. Platform support is still a bit limited, though it’s better than Philo. You can watch YouTube TV on your web browser, Android/iOS devices, Chromecast, and the Xbox One, as well as select Smart TVs. While YouTube TV is more expensive than Philo, it offers a more comprehensive selection of channels, an incredible DVR, and reasonable platform support that makes it worth the money. Hulu With Live TV is still in beta, but it’s a great alternative to Philo if you’re interested in combining live TV with Hulu’s library of on-demand content. Your $39.99/month Hulu With Live TV subscription gets you access to between 60 and 70 cable channels depending where you are, including USA, A&E, FX/FXX, TBS, and SyFy. You also get sports coverage from Fox Sports 1 and 2, ESPN/ESPN2, and local CBS/NBC/FOX/CBS affiliates. Interestingly, your subscription also includes a base-tier, $7.99/month Hulu subscription for no additional cost. This means you can watch the entire library of Hulu on-demand content with no restrictions, in addition to your live channels. Hulu With Live TV is a bit more restrictive than Philo when it comes to simultaneous device streaming. You can only stream on 2 devices unless you purchase the $14.99/month “Unlimited Screens” package. With Unlimited Screens, you can stream on 3 devices outside the home, and unlimited devices on your home Wi-Fi network. You will also get a DVR with 50 hours of recording capacity, and no other restrictions. You can double this capacity for $14.99/month with the “Enhanced DVR” package. You can also combine this with the Unlimited Screens package for a $19.99/month fee. Platform support is also much better than Philo. Today, you can watch Hulu With Live TV on Apple TV, Amazon Fire devices, Chromecast, Xbox One and 360, web browsers, Android and iOS, some newer Roku devices, and select Samsung Smart TVs. You can even watch on the Nintendo Switch — Hulu is the only streaming company offering a Switch app, at the moment. Hulu With Live TV is more expensive than Philo, but provides you with access to a huge library of on-demand content at no additional cost, and has a much better choice of channels, as well as a comparable DVR, and it has the best platform support — bar none — of any internet TV service. PlayStation Vue is a good alternative to Philo if you have a large family. Though it will cost you $45/month for the base-tier “Access” package, PlayStation Vue has a number of benefits that make it worth the price. You can also choose to subscribe to the $50/month “Core” or $60/month “Elite” package for access to additional cable channels, or the $80/month “Ultra” package for access to premium channels like HBO and Showtime. See the full details at the PlayStation Vue website. Even the cheapest “Access” package offers a much better choice of channels than Philo, with options like ESPN, Fox Sports channels, local NBC/CBS/ABC/FOX channels, and entertainment channels like Cartoon Network, FX, and SyFy included. But that’s not the best part of PlayStation Vue. The biggest feature of this service is their unparalleled 5-device simultaneous streaming policy. This is better than any other service out there, with the exception of the Hulu “Unlimited Screens” package (which would run you $14.99/month in addition to your subscription). PlayStation Vue also offers robust platform support. You can watch PlayStation Vue on PlayStation 3/4 consoles, web browsers, iOS/Android, Chromecast, Roku, Amazon Fire TV, and Apple TV. You can try PlayStation Vue for 5 days for free by visiting their website, and see if you like the service. If you’re interested in a low-cost alternative to Philo, we’d recommend either Sling TV Orange or Blue. Both of these services have much better channel selections at a comparable cost to Philo, even though you have to pay extra for a DVR. DirecTV Now is also a contender here – but only if you can get the $20/month AT&T Unlimited subscriber deal. Otherwise, the $40 price tag knocks it out of contention. Our top overall pick for the best alternative to Philo is YouTube TV. Though it will cost you a bit more, at $40/month, it has reasonably good platform support, a fantastic DVR, and a 3-device simultaneous streaming policy. Hulu With Live TV is also a viable choice if you are interested in a Hulu video-on-demand subscription as well as live TV, and its platform support is better than YouTube TV. PlayStation Vue is a good choice if you have a large family, but it’s a bit expensive, and not really worth the money if you don’t need to share your account. Finally, fuboTV is a good choice if you love sports – but beyond sports coverage, it’s hard to justify the high $45/month price point of the service.